This Belleek Christmas ornament was introduced in 2015. 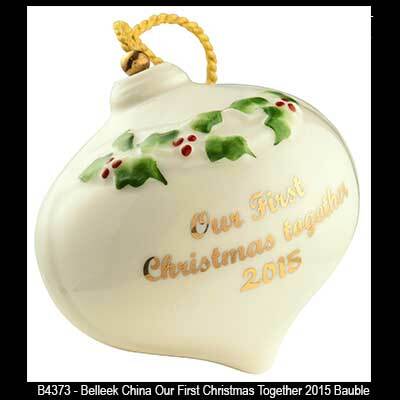 Our First Christmas Together 2015 is a Christmas Tree Bauble from Belleek China. The Belleek ornament is made of fine china and features their signature hand painted shamrock on the back along with holly and berry accenting; the text is written in gold on the front. The Belleek first Christmas together 2015 ornament measures 2 3/4" wide x 2 3/4" tall and is ready to hang with the included gold tassel. 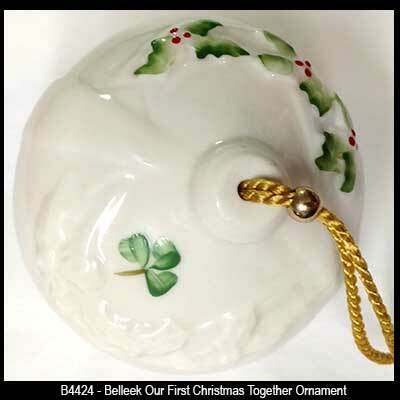 Belleek ornament celebrates our first Christmas together in 2014.